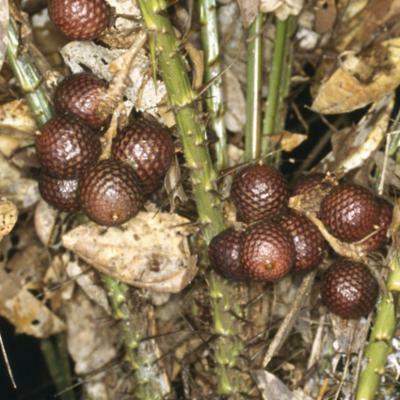 This species is accepted, and its native range is Borneo (Brunei, W. Sarawak). 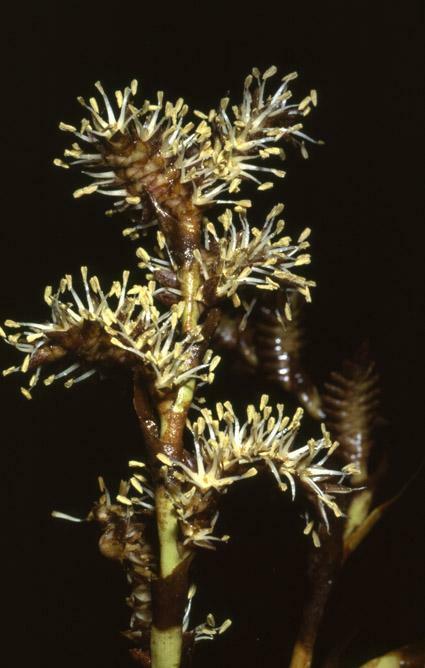 Known from a single collection from Andulau Forest Reserve. Elsewhere known only in the First Division of Sarawak. Endemic. Massive solitary short-stemmed rattan with erect or sometimes decumbent stem to c. 1 m only; stem without sheaths to c. 5 cm diam., with sheaths to 10 cm diam., internodes very short, to 3 cm only. Sheaths tubular at first, later splitting opposite the petiole for much of their length, dull green, densely covered with robust triangular green spines 5-70 × 3-6 mm, and scattered deciduous scale between the spines; spines around the sheath mouth sometimes more slender and erect; knee absent; ocrea inconspicuous. Flagellum absent. 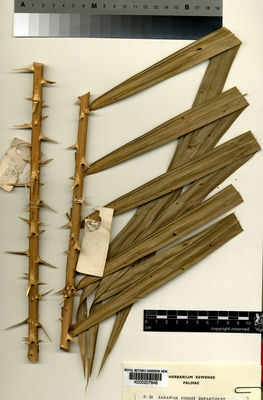 Leaf robust, ecirrate, arching, to 2.5 m long including the petiole to 50 cm; petiole deeply channelled, densely armed with horizontal spines 5-60 × 3-6 mm with swollen bases; leaflets c. 50 on each side of the rachis, narrow, very regular, the longest c. 50 × 2 cm in mid leaf, decreasing to c. 16 × 1 cm at the tip, transverse veinlets very fine and close. 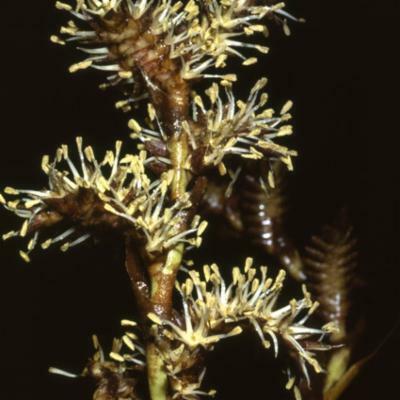 Inflorescences short, rarely more than 30 cm, the male with up to 5 partial inflorescences, the female with 2 or spicate; male rachilla curved, c. 5 cm long, the female c. 5.5 cm. 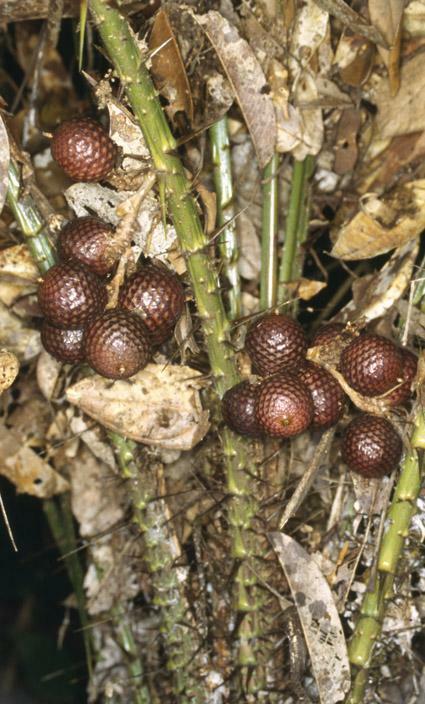 Mature fruit rounded or somewhat top-shaped, c. 20 mm diam., covered in c. 26 vertical rows of dull straw-coloured scales. Seed ± oblate, 20 × 15 mm, very deeply grooved and pitted, the endosperm otherwise homogeneous. Seedling leaf not known. (Fig. 48, Pls 11B, 12A, 12B).